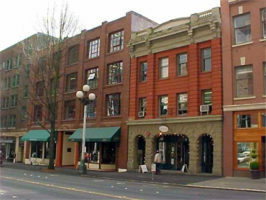 A Seattle-based partnership led by investor David Zarett paid $7 million to buy the Alaska Trade Building and the adjacent Butterworth Building, in the 1900 block of First Avenue in Seattle, from investors including Paul Liao of engineering firm KCM Inc., property records show. Sally Patterson and Dan Stutz of Martin Smith Inc. represented the Zarett partnership, ATB LLC. KCM is the primary occupant of the property.